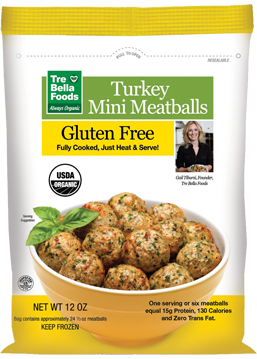 Products - Tre Bella Organic Foods, Inc.
Our turkey mini meatballs are 100% certified organic and Gluten Free. With 50% less fat and calories than beef meatballs, our turkey mini’s are a healthy choice for the whole family. INGREDIENTS: Organic Turkey, Water, Organic Ricotta Cheese (organic grass-fed whole milk, organic vinegar, sea salt), Natural Romano Cheese Flavor (Romano cheese [pasteurized cow’s milk, cultures, salt and enzymes], water, butter, sea salt), Organic Potato Flakes, (organic potatoes, mono and diglycerides), Organic Soy Flour, Organic Olive Oil, Sea Salt, Organic Spices, Organic Minced Garlic, Organic Onion Powder.